The O-ring…the little part that plays a big role! “What are the parts of a car?” Most people will answer with “engine, thermostat, radiator, water pump, battery, alternator, ignition, steering wheel, tires, windows, doors, and seat belts”. Not too many people will mention O-rings. But, O-rings play an integral role in the manufacturing and operation of vehicles of all kinds, as well as most other everyday items such as appliances, pumps, and medical devices. An O-ring is “a loop of elastomer with a round cross-section, designed to be seated in a groove and compressed during assembly between two or more parts, creating a seal at the interface.” (https://en.wikipedia.org/wiki/O-ring). Like the name implies, an O-ring is a round, rubber ring. 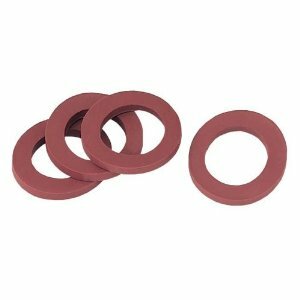 O-rings are used to create a tight seal between assembled parts to prevent fluids or air from passing from one part to another. The simple little O-ring is often one of the most important components in finished goods. Without properly installed O-rings leaks and product failures could occur. O-rings need to be properly installed to do their job and function properly. When installed correctly, O-rings can prevent leaks and add to the service life of the component. Incorrectly installed O-rings may cause leakage resulting in part damage, requiring taking apart and reassembling the component. Some common problems that occur during O-ring installation include tears, twisting and turning, and overstretching. Installing O-rings properly at the outset saves time and money in the long run. These installation tips can help you avoid problems that may cause application issues down the road. Size Matters: Use the right size O-ring for each unique assembly. O-rings that are too small are more prone to tearing and breakage. O-rings that are too large will not provide an adequate seal. Avoid Overstretching: Each O-ring has a maximum stretch point. Overstretching can cause O-rings to break or tear during assembly or use. Engineers need to ensure that the stretch does not go beyond the maximum elongation of the O-ring. It’s also important to stretch the O-ring evenly, not just on one side or the other. In general, try to stretch the O-ring as little as possible for a tighter fit. Slide, Don’t Roll: Rolling an O-ring down a shaft for installation leads to spiraling. Spiral wound O-rings cannot be properly installed and their functionality will be limited. This can result in leaks and/or damage to the finished assembly. Sliding the O-ring into place, rather than rolling it, helps avoid spiraling. Using a lubricant helps the O-ring slide easily into place. Ease O-rings Over Threads: O-rings are often mated with threaded parts. The threads can easily tear the rubber O-rings. Covering the threads with masking tape during installation and using an assembly lubricant can help protect the O-ring from nicks and tears. Keep Away From Sharp Edges: Some mated parts may also have sharp corners or edges that can damage O-rings. Sometimes these tears are so small they are not visible, resulting in leakage problems later on. Avoid forcing O-rings onto sharp corners and edges. Lubricating the O-rings makes it easier to slide them into place. Overall, it’s best to avoid using excess force while installing O-rings. 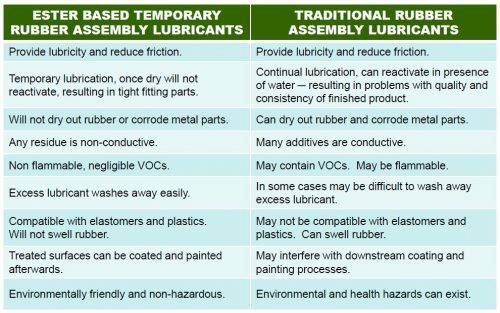 Using an assembly lubricant helps ensure that many of the above problems are avoided. Using a lubricant for O-ring assembly can prevent tears, twisting, pinching, cutting and abrasion of the rubber. A thin film of lubricant applied to the O-ring fills in any gaps, holes, or spaces between the O-ring and the mated part, allowing them to slide across each other. By reducing the surface tension between the two surfaces, the O-ring can slide into place easily, providing a tight fit. There are numerous types of lubricants that can be used to install O-rings. 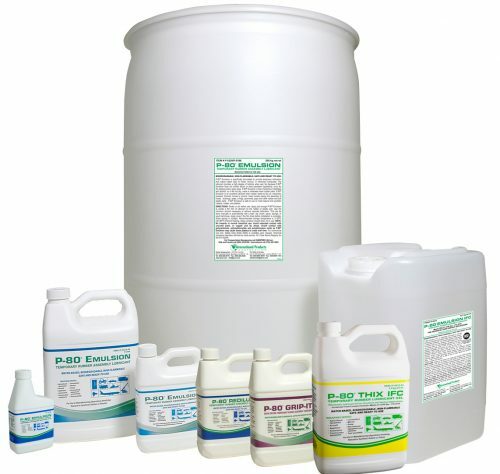 Some common choices include soap and water, petroleum distillates, solvents and ester based products. Many traditional choices may cause damage to the rubber O-ring or present safety concerns. For example, petroleum based products can cause rubber to swell or dry out. Solvents provide poor lubrication, contain high VOCs, may be flammable, and pose possible health risks. Soap and water, while safe, provides inconsistent, nominal lubrication and may reactivate when wet causing problems after assembly. 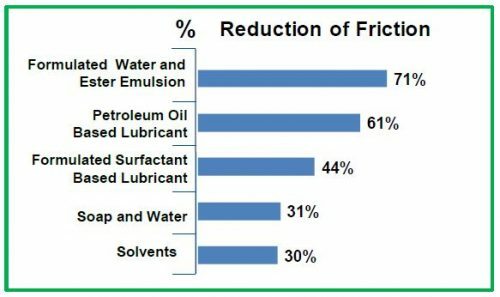 Ester based lubricants are an ideal solution. They provide excellent reduction in friction, offer temporary lubrication, and are safe for both workers and the environment. P-80® Temporary Rubber Assembly Lubricants are an excellent choice for O-ring assembly. P-80® lubricants significantly reduce friction helping rubber parts slide easily into place. And, they do not contain any hazardous ingredients, making them safe for workers and the environment. P-80’s unique, water-based formula is temporary; once dry, P-80 stops lubricating and parts remain in place. Installing O-rings doesn’t have to be a struggle. Remember, these small rubber parts can make or break the functionality of your finished assembly. Take the time to install them properly and use a temporary assembly lubricant to aid the process and protect the part. Contact International Products Corporation to learn more about using P-80 Rubber Lubricants for O-ring assembly.